ACCURATELY rendered colours in microscope images should be something microscopists can take for granted, but of course much depends on the light source and the filters deployed. Olympus says it has improved on the current technology with its new true colour LED illumination and built in Light Intensity Manager (Lim), as available on its BX3 clinical microscopes. 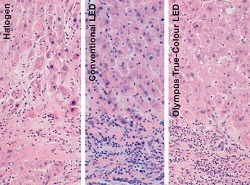 Using true-colour LED and Lim, Olympus says that cytological and histological stains appear exactly the same as they do under daylight-filtered halogen. The LED light sources promise longer lifetimes and reduced power consumption, as well as a constant colour temperature at all voltages. Along with the Lim, which improves workflow and maximises consistency by automatically modulating light intensity at different magnifications, this makes the BX3 a logical choice for clinical microscopy, it says. Pathological and cytological analysis depends on years of expert experience, which has been developed using traditional halogen bulbs and daylight filters. LEDs offer distinct advantages, operating at lower temperatures and saving energy, but have not generated the level of colour reproduction obtained using halogen. This dilemma has been solved, says Olympus, with this new system which uses the most advanced mixed-matrix brightfield LED technology currently available. Stains such as haematoxylin and eosin, as well as papanicolaou, look the same under true colour LED as under halogen, allowing similar colours to be differentiated. Lim automatically modulates light intensity when changing objectives, so that consistent illumination is maintained without manual adjustment. This saves time, simplifying and improving the screening process. Automation uses sensors in the nosepiece to detect which objective is in use and manipulate the LED intensity accordingly.